This applies to most basic level scientific calculators. Only arithmetic operations and polar/rectangular conversions apply in this mode. Please be aware that in this mode where the [ a ] and [ b ] keys have to be used, the order of operations are not followed. Complex numbers using a + bi notation are entered exactly as they are written. This mode is present on more advanced scientific calculators, particular the multiline calculators, as well as all graphing calculators. The ability to calculate and display complex numbers may be turned on in a separate mode, or turned on through a set up menu. In this complex numbers mode, the order of operations is followed. That is two primary ways how complex numbers are entered on scientific calculators. The program PMTLENGTH will calculate how many payments that are required to finish a loan, given a certain annual interest rate and payment. Payments are assumed to be monthly, and end of period. The program will also return the last payment. Due to the rounding in the financial algorithms, the last payment is an approximate (unless the interest rate is 0%). Firmware 13441 or later is required. // how many monthly payments? Example 1: How long will I take to pay off a $2,000 loan if I make $600 payments each month? This is a no interest loan. It will take 4 payments, with the last payment being $200. Example 2: How long will I take to pay off a $5,350 loan if I make $750 monthly payments each month? The loan has a 10% monthly interest rate. It will take 8 payments, with the last payment being about $286.91. I still love the TI-25X Solar, I wish the screens weren’t so damn fragile! I went through two of them. I have two fx-115 ES Plus calculators, one gray and one black. The black looks much better! Maybe one day I’ll get the BA 35 Solar again from eBay. Maybe I will give the Casio FC-200V a second shot. As of March 2018, Casio fx-3650pII is the current edition of the fx-3650P. The fx-3650PII is in the shape of the fx-115ES/991ES/300ES/82ES Plus. That’s about it from what I can get from research: still four program areas with 360 steps and 7 variables. No, Casio still currently sells the fx-3650PII only outside the United States, which means for us Americans, we have to order online. An open invite to Casio to stock the office stores and university stores with this model in the States is extended. The current Sharp EL-W516 edition, the EL-516WT, eliminated the formula storage, eliminated the catalog, and reduced the definable keys from 4 to 3, I am not happy about that. The Classwiz model is the next step in Casio solar powered calculators. They have an icon menu, like their graphing calculators, and there is an [OPTN] key that allows users to specific mode-specific functions. Modes includes computation (COMP), complex numbers (arithmetic, polar/rectangular conversions), base integers, matrices up to 4 x 4, vectors, statistics, distributions, basic spreadsheets up to 5 x 45, equation solving, inequalities and ratios. The newest feature is the QR function that will take a screen shot of the calculator, or in some cases, statistical graphs, which can be retrieved from the Casio QR Website or app. I can only hope the next iteration the Classwiz and the fx-3650P or fx-50FII merge so programming will be included. I don’t know what I was thinking when I skipped this model last time. The fx-260 offers a wide variety of functions: trigonometry, logarithms, fractions, degrees and degrees-minute-second conversions, polar/rectangular conversions, and one variable statistics. 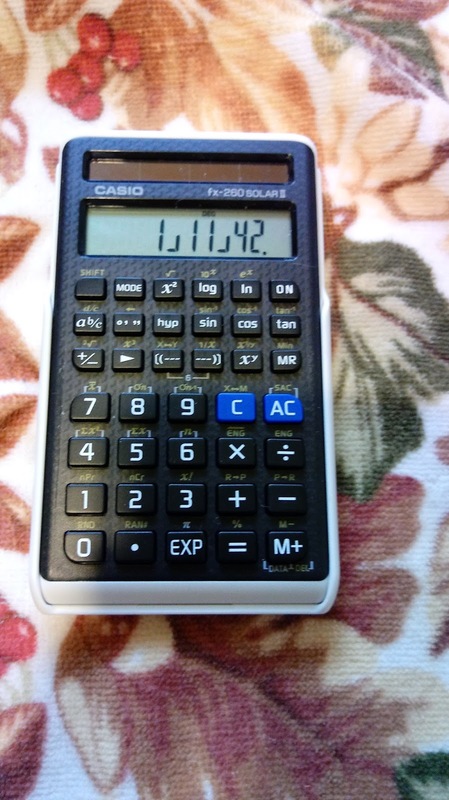 This is great calculator for those who want a small, compact, calculator that attacks the basics. The fx-260 series is completely solar powered. 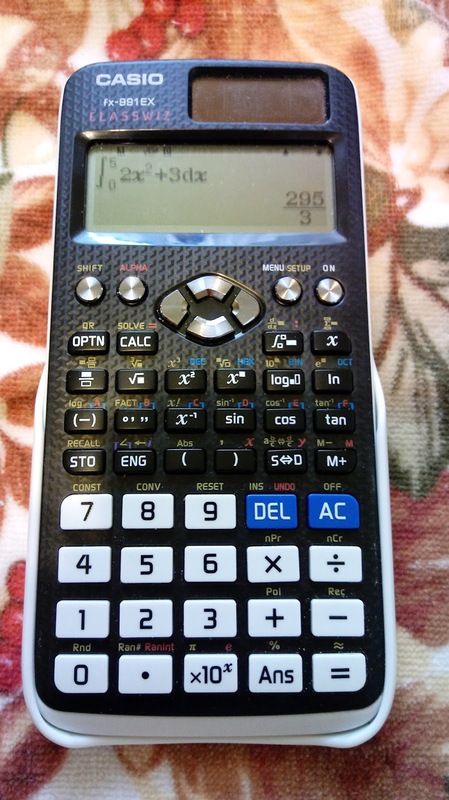 Pictured is the newer fx-260 Solar II, which the mode markers have been mode to the back of the calculator case. Can’t beat the classics. On a trip to Fry’s for computer headphone/microphone set, I always head to the aisle where the calculators are. Besides the “dollar store calculators” and printing calculators, every one Fry’s had I have their model. Except for the F-605, which was packaged in a box. So to the check stands I went, with the F-605, a $2 A+ Homework scientific calculator, and headphone set in tow. Another Clone of the Sharp EL-501X… or is it? At first glance, the Canon F-605 looks like a clone of the Sharp EL-501X. Sure, it has it’s complex numbers, complete with the [ a ] and [ b ] keys, the keyboard is nice and compact, and it has its base conversions with one variable statistics. Close inspection, the F-605 differs from the EL-501X in a number of ways. 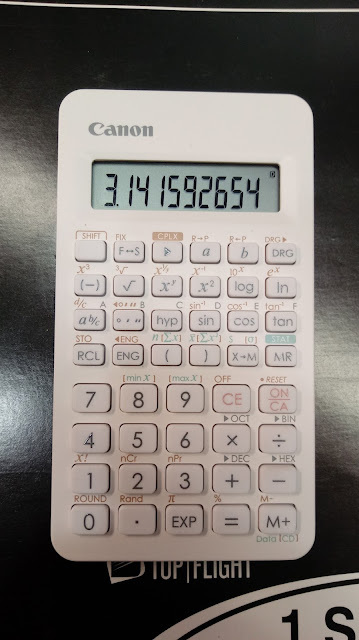 The display has 10 digits, but carries 14 internal digits. We have our scientific functions, logarithmic functions, exponential functions, hyperbolic functions, decimal degrees/degrees-minutes-seconds conversions and power and root. The [ F←→S ] converts the display from floating to scientific notation. For the polar/rectangular conversions, the [ a ] and [ b ] keys are used. [ a ] is used for x and r, while [ b ] is used for y and θ. Here is where the Canon F-605 starts separating itself from the rest of the clones. The F-605 offers fractions, with fraction/decimal conversions and improper/proper fraction form conversions. The F-605 has a random number function which generates numbers from 0 to 1, which has three digits. One of the great surprises the F-605 has is that it has seven memory registers, A through F, and M. There are also the arithmetic storage functions M+ and M-. The nice thing is that all seven memory registers are available on all the modes, except for statistics, where M is not available. Base Display Modes (except for Decimal) is limited to arithmetic. To convert numbers, just call their respective mode. There are still no Boolean functions, just arithmetic. The F-605 has one variable statistics. In addition to mean, deviation, and sums, the F-605 offers the minimum and maximum of the data set. In statistic mode, parenthesis and store to M keys are used for accessing statistical results. You can’t use parenthesis in stats mode on the F-605. 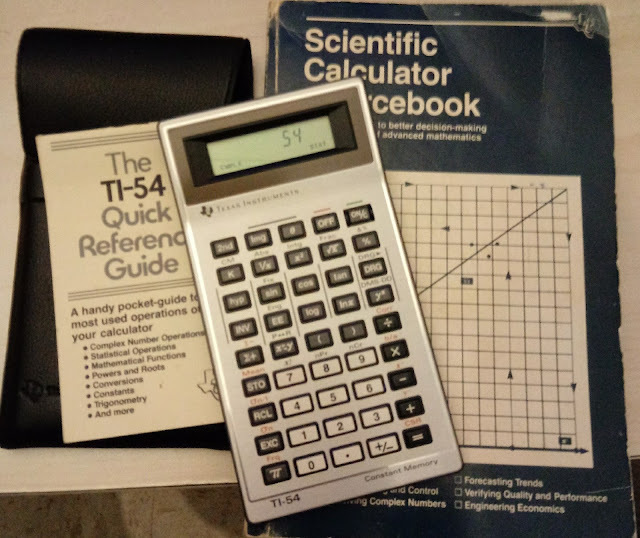 One thing I am very happy about, unlike most of the scientific calculators in this family, the F-605 has it Statistics mode on a key other than ON/C! Yes, putting a mode as the second function of the clear button is very annoying. The keyboard is very clean, and fonts are readable. The keys do have a rubbery feel, but so far, out of the using it, I have no complaints about the response. The calculator is very light weight. If you are looking for an inexpensive $10 (or possibly less) scientific calculator and you don’t want a solar calculator, I can recommend the F-605. I would say that the F-605 is just above the Casio fx-260 Solar or Sharp EL-501X. The program ADVPMT calculates the monthly payment of lease several payments are paid simultaneously at the beginning of the lease. Firmware 13441 is used. This program uses the TmvPV function from the Finance App. The “Finance.” suffix will allow the program to be used regardless of which app HP Prime is set to. Find the monthly payment of a 48 payment, 4.6% lease where 3 payments are required in advance. The amount financed is $10,000 with an expected salvage value of $2,000. Each payment will be $263.54, with the first payment being three times that amount, or $790.62. Hewlett Packard. HP 17bII+ Financial Calculator User’s Guide Edition 3, 2007 San Diego. Happy Pi Day! 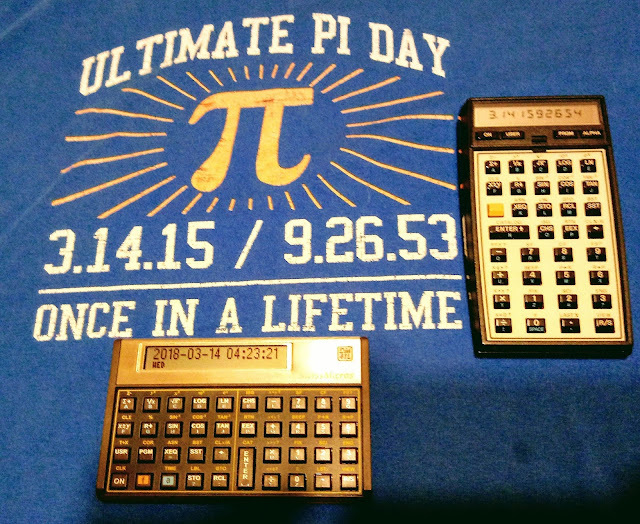 Here I am celebrating with a couple of 41s (Hewlett Packard HP 41C, Swiss Micros DM41L). 1. I like to have the user input all the values into the registers before running the program. This way, we can save program steps because the calculator doesn’t have to stop to ask for inputs. Also, you don’t have to change all the values for different problems. Finally, R/S can be used for only output. 2. I keep register 0 (R0) out so that the user can have at least one register to store immediate results in further calculations. I list the minimum partition for each program. Note: for kilometers, replace 3959 with 6371. Set the TI-60 in degrees mode. Tip: For DMS-DD conversions: if you have a negative angle, enter the angle without the negative sign, do the conversion DMS-DD, then press [ +/- ]. This program gives both the magnitude and phase angle. How good of an approximation depends on how close x0 and x1 are, and whether the curve that is being approximated is close to linear. Purchase of a Car: How much can I afford? The program will calculate the sticker price (price before sales tax) of an automobile that you can afford. You give the term you want, the interest rate you qualify for, the sales tax rate, and the maximum payment you can afford. This assumes that you don’t put any money down. In this example, the highest sticker price that can be afforded is $19,357.34 (before sales tax). 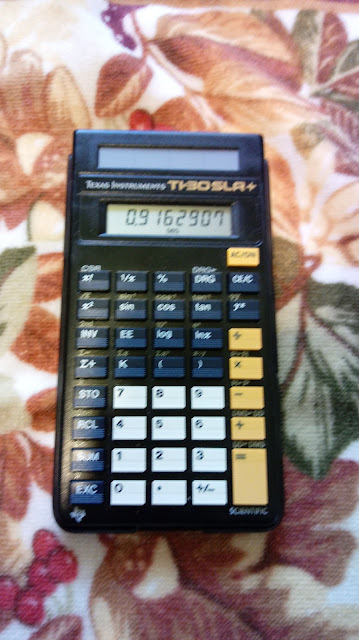 I enjoy programming with the TI-60, unlike most Texas Instruments calculators that have keystroke programming, the TI-60 shows the step and key code you have entered instead of advancing to the next step with code 00.